And here’s a detail, so we can get a closer look at the colors. 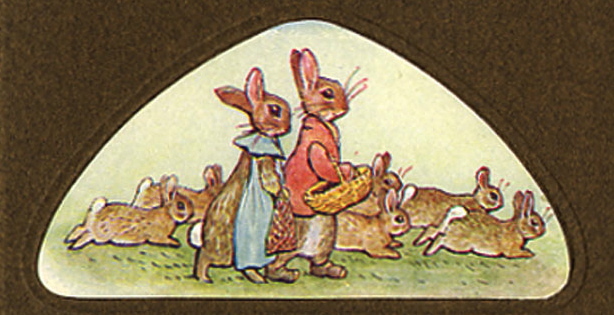 When I think of bunnies and Beatrix Potter, I can’t help but think of sunny spring gardens full of flowers (and maybe a few tasty veggies?). After getting piled with about five feet of snow (no kidding), I am seriously in the mood to spend some time in the garden! So I dug around in my stash and put together a few looks inspired by this color scheme…and inspired by a fantasy garden in a far-off fantasy spring. I wanted to keep the first look really simple–something that would be very flattering and quick and easy to pat on for day, but would also introduce some pretty textural contrasts. I thought we could take a fairly straightforward path this time around, with bronze sheen on the lids, a touch of shimmery-peach highlighter, and peach shades for lips and cheeks. In the cover closeup, you can sort of see the texture of the brown frame for the text and images on the cover. There was something really interesting to me about that brown–I think I can see flecks of yellow in it, mixed in with a more-neutral brown shade. I wasn’t feeling a matte shade on the eyes for this look–I felt like a fresh day look that was looking forward to spring could use some shine. 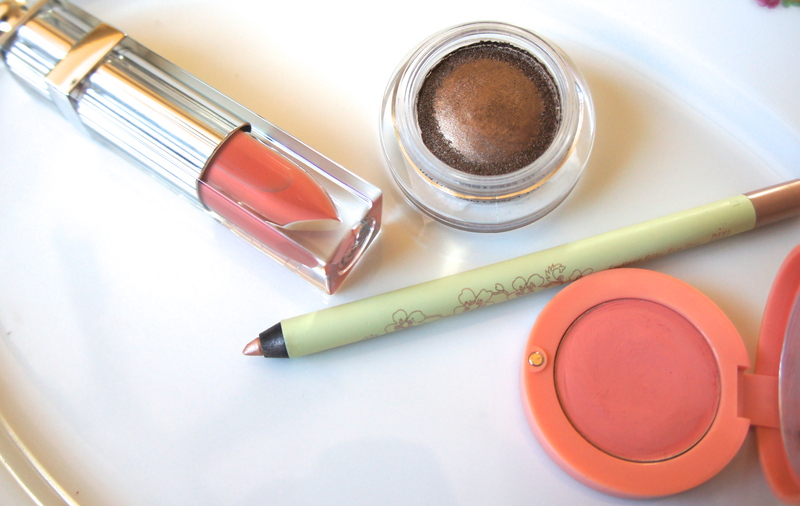 I looked at a few different bronze-metallic possibilities for the shadow, in pot, stick, and powder form, and finally settled on the Chanel Illusion d’Ombre in Mirage. Its bronze seemed to be just right–not too metallic, and not too red, either. On cheeks and lips, I chose similar shades with contrasting finishes. (I think it’s nice when putting together a monochromatic–or, in this case, semi-monochromatic–look to play with different textures and finishes on various features.) For the lips, I chose a glossy-peach liquid lipstick from Dior (which is, coincidentally, also called Mirage). For cheeks, the extremely useful and versatile Bourjois Cream Blush in 01. A few observations on the Dior lip product: I was a little dubious about liquid lipsticks, but as it turns out, I really enjoy using this Dior one. It’s a true peach shade, I would say, in the sense that it isn’t too pink. It feels nice on the lips, and it has a pretty glossy finish with good (if pale) color payoff. It’s reasonably long lasting for a glossy product (although the gloss on the finish transitions to a more satiny finish within a couple of hours, in my experience), and it wears off evenly. I don’t like the sticky feel of many lip glosses, but I do feel pretty comfortable in these Dior liquid lipsticks. And it’s fun to play with a glossy finish on the lips now and then. 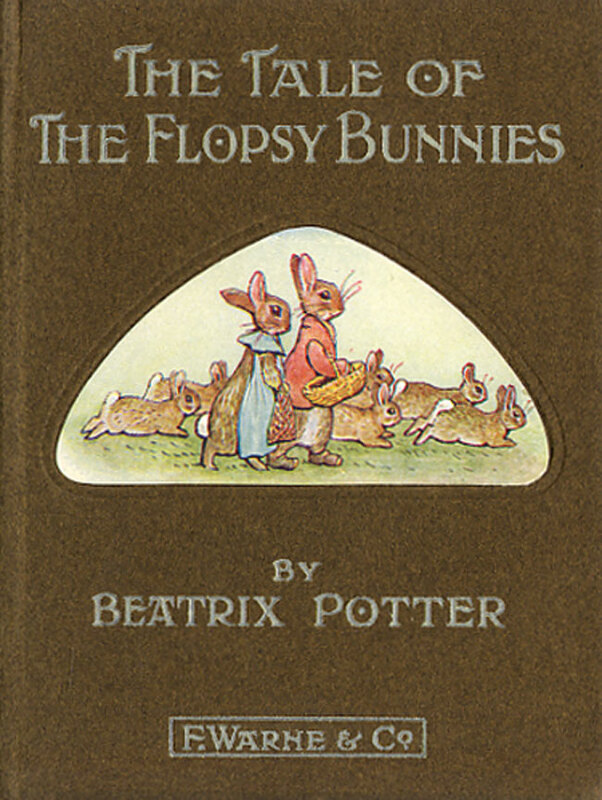 And that’s the first look I have inspired by Beatrix Potter, the rather adorable cover of The Tale of the Flopsy Bunnies, and a wintry yearning for spring and gardens, sun and blossoms and flowers. This is the kind of makeup I really like to wear everyday–a few products that perform well, with good-feeling, modern textures, with lots of neutrals and peachy-pinks and (in my view, anyway) easy-to-use, long-lasting creams. I composed a few more looks that are more complicated and a little bit more daring, but still, I hope, wearable. So I’ll look forward to sharing those with you in the coming days!